This album serves as a journey which details the transitional and evolutionary process of combining the Chiptune / Chipmusic style with orchestra. While some tracks are heavily electronic, others are heavily orchestral, with a fair amount in between. 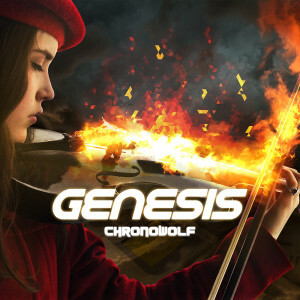 It was an important goal in this album to provide variety as a means to transition listeners into the idea of hearing chiptune mixed with orchestra. It was as much a personal journey as well, with the tracks on the album serving as snapshots along the process of discovering a love for both genres and helping them to coexist harmoniously. Hence the name ‘Genesis’ which is defined as: “The origin or mode of formation of something”. This album is the beginning of my journey in Chipmusic, and the formation and evolution of something unique. The goal with the album is to gradually introduce people to the idea of hearing Chipmusic combined with Orchestra and Choir, while also maintaining enough variety across the entire spectrum to appeal to any listeners that may choose to stand on one side or the other. It may not be the first time this combination had been attempted, but I really hope that my experience in the orchestral genre will lend this album a unique touch. The primary equipment used in the album is a DAW running Cubase 5, with an extensive array of VSTs and plugins, including (but not limited to): The East West Quantum Leap Symphonic libraries, various Native Instruments plugins within the Electronic music genre, and a series of custom made VSTs for including genuine chip sounds in the music. The legacy hardware for chiptune used in the production of this album was a Texas Instruments TI99/4A with the Music Maker (bleeps and melodies) and Terminal Simulator (for the Speech Synthesis) command modules. Also an Atari1040STe was used, where samples from Mat’s original tracks (from years ago) were extracted and included in the album. The primary reason for the heavy use of a DAW instead of a tracker was the reliance on a more powerful platform to support the orchestral accompaniment.